Everyone loves a photo booth opportunity. Pair it with green screen capabilities, instant touch-screen editing powers, and Facebook and Twitter links; and you’ve got TapSnap, the hottest new wedding reception accessory. 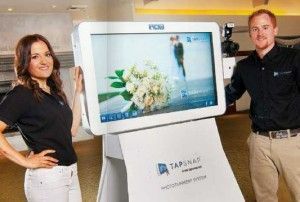 Ryan and Nicole Kidd couldn’t pass up the opportunity to expand their business, Access DVD, when approached with the TapSnap kiosk in 2013. Because as Ryan explains, “it’s just such a cool product!” As one of the California’s very first TapSnap owners, Ryan and his product wowed corporate parties and events in the San Joaquin area. We LOVE sushi! Our favorite sushi restaurants include Haru Sushi and Oz Sushi – both in Lodi. If you had $500 to spend where would you go shopping? My wife and I have very different views on this answer. She says she would spend her money at one of the many boutiques in Lincoln Center. I would be spending it at Home Depot. What do you do locally in your free time? We like to take our son to one the many parks in town or for a walk around the nature trail at Lodi Lake. During the summer, we take out boat out for some wake boarding and enjoying the sun on the Delta. What is your favorite Aspect of San Joaquin Country? Our favorite aspect would probably be the small town feel. We love this community and we think it is such a wonderful place to raise a family. Everyone sticks together to support small town business. Source: Rodrian, Lindsey. "Ryan and Nicole Kidd." San Joaquin Magazine, July.